How do you want to complete your education? 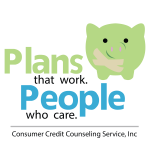 Consumer Credit Counseling Service, Inc. (CCCS) has over 32 years of experience educating consumers and Debtors about money and credit. Our certified instructors have completed the certification program with the National Foundation for Credit Counseling (NFCC) and are required to continue their education yearly to maintain this highly regarded certification. Our agency is a member of the (NFCC). The NFCC has high standards for quality credit counseling and debtor education, and our agency complies with those standards. In addition, our agency is certified by the Council on Accreditation, an independent third-party organization that reviews and monitors entities who provide social services. CCCS is a non-profit agency. We are organized and operate in accordance with Section 501(c)(3) of the Internal Revenue Code. CCCS receives funding in the form of grants from banks and other financial institutions that support financial counseling and education. We do not pay or receive fees or other considerations for referrals of debtor students to our agency. CCCS is obligated to provide your certificate promptly upon completion of instruction, and we will do this within 3 business days upon the completion of your course. You will only receive your certificate upon completion of Post-filing debtor education course. CCCS might disclose debtor information to the Executive Office for the United States Trustee (EOUST) in connection with the United States Trustee’s oversight of the Provider, or during the investigation of complaints, during onsite visits, or during quality of service reviews. The EOUST has only reviewed and approved Pre-filing credit counseling and Post-filing debtor education services. CCCS does offer services to help with unsecured debt if needed. The education course was put into place to help give those filing some new financial tools and advice to help them start over financially. The course will help you focus on establishing new goals, building a new spending plan and learning how to restore and rebuild your credit. If you are completing this process in-person, you will attend one of our pre-scheduled classes and you can register by calling our office. Our classroom is located behind the elevators in the lobby of our Wichita office. When you complete this counseling in person the counselor will provide you copies of your certificate after the class. If you are completing this process online then you will need to register with our online program Money in Motion by paying through our PayPal link below. Once you pay you will receive an email with your User ID and password and you just need to complete the course on your own time. Upon the completion of Money in Motion our agency will provide you a certificate of completion promptly, no later than 3 business days from the completion. If you are completing this process over the phone, you will call into our conference line to one of our pre-scheduled classes and you can register by calling our office. When you register with our office we will send you out a packet of information that will tell you how to access the class. When you complete this counseling over the phone you will receive your certificate of completion once we receive the proper paperwork in our office either by mail, fax or email. To help cover the cost of providing the Post-filing debtor education to you, this agency charges a fee of $35 for in-person/phone education or $30 for online education, regardless if you file single or jointly, payable by debit/paypal. We do accept personal checks and cash. We do offer fee waivers and you can see more information by clicking on the links above to the method of service you would like for the education course. This agency has a policy of prohibiting it from paying or receiving referral fees for the referral of debtor, except under fair share agreement. No fees are either paid or received by our agency for the referral of a debtor to a bankruptcy attorney or any bankruptcy alternative agency.